19 hours on an overnight train from Mumbai was enough to get us as far as Mangalore — a city about as illustrious as Ottumwa, Iowa — finally reaching the UNESCO town of Ft. Kochi another 24 hours later. 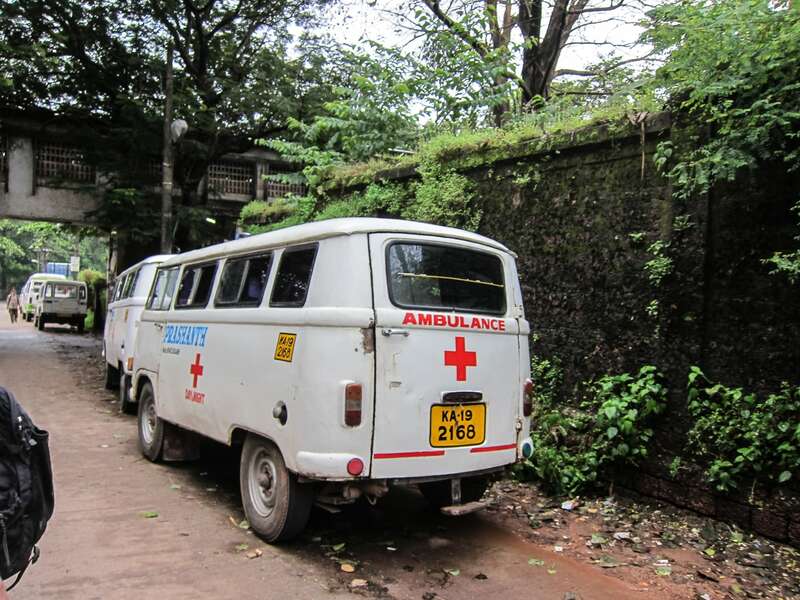 We originally planned to take a mind-numbingly long train ride from Mumbai all the way down to Cochin in the deep south — nearly a thousand miles that would have taken around 27 hours on a train, on a good day — but thought better of it. 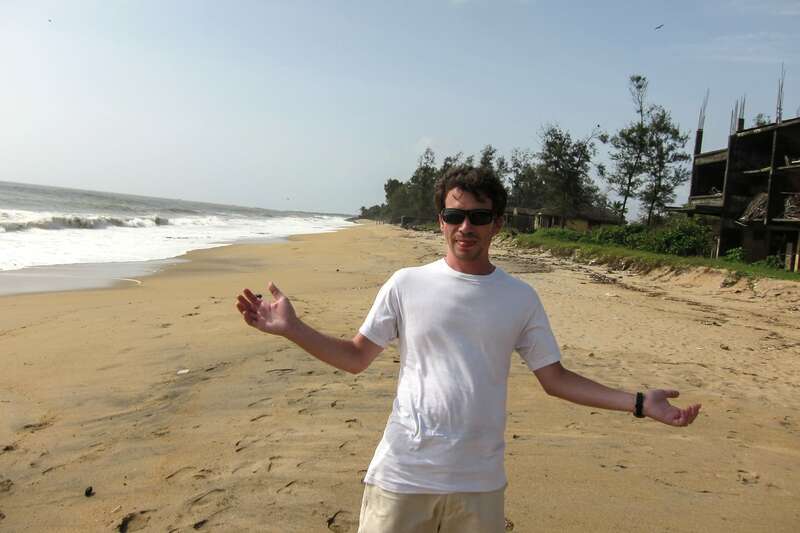 Instead, we chose to break up the trip in exciting Mangalore! No, not Bangalore. Mangalore. Never heard of it? You’re not alone. Actually, that’s a lie. We didn’t choose to stop in Mangalore. No traveler in their right mind would choose to stop here. Mangalore chose us. I couldn’t seem to get a ticket out of Mumbai down to Cochin. We wanted to get down there. We would have welcomed a 27 hour train ride if any had been available. This is where I got creative. I pulled up my three trusty online resources cleartrip.com, indiarail.gov.in, and irctc.co.in, and got crackin’. With no interruptions, I locked myself in a room for an hour, cross-referencing and running internet queries like a madman, until I figured out that we could get tickets on an overnight train to Mangalore and then another train from Mangalore onward to Ernakulum (Cochin) the next day. Crisis averted! 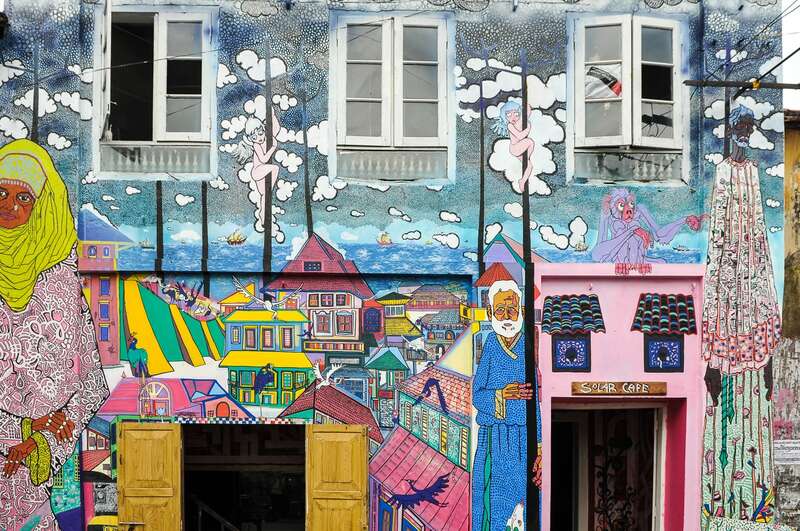 But it meant staying almost 24 hours in a city that did not intrigue us in the least. What better way to experience the real, day-to-day India that many travelers never see…right!? I’d really have to say that the Mangalore Prawn Fry at Lalith Restaurant (I forget what the actual name of the dish was, but it was rumored to be the dish to order in Mangalore) was the highlight of our time there. It was DELICIOUS! One of the best plates in India. Seriously. Lalith offers A/C dining…for a price. 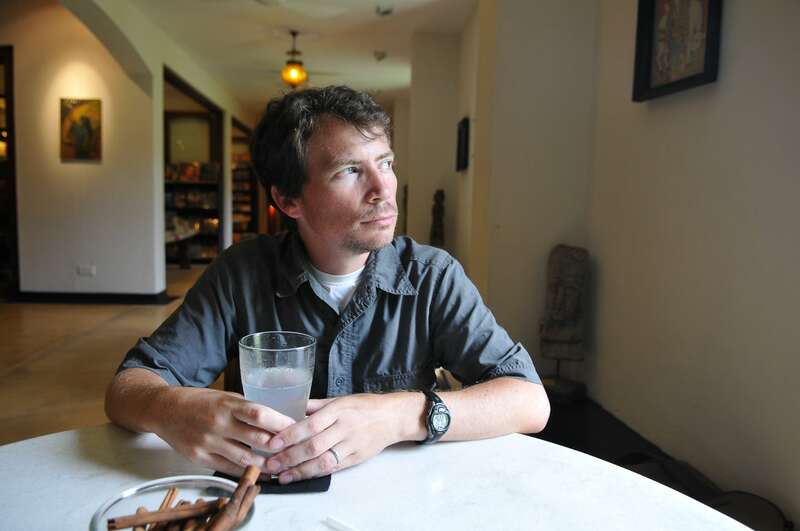 It seemed nonsensical — two large dining rooms, one freezing and completely empty, and the other hot and humid, yet fan-cooled, and quite packed. To entice you, management routed you through the A/C section to get to the non-A/C room, but their ploy didn’t seem to be working. Unless they get a good number of A/C-lovers on every other day, I don’t see how this makes good business sense. Just one of countless things I’ll never understand about India. I mean, the photos say it all (and the smiles on the children’s faces are priceless). 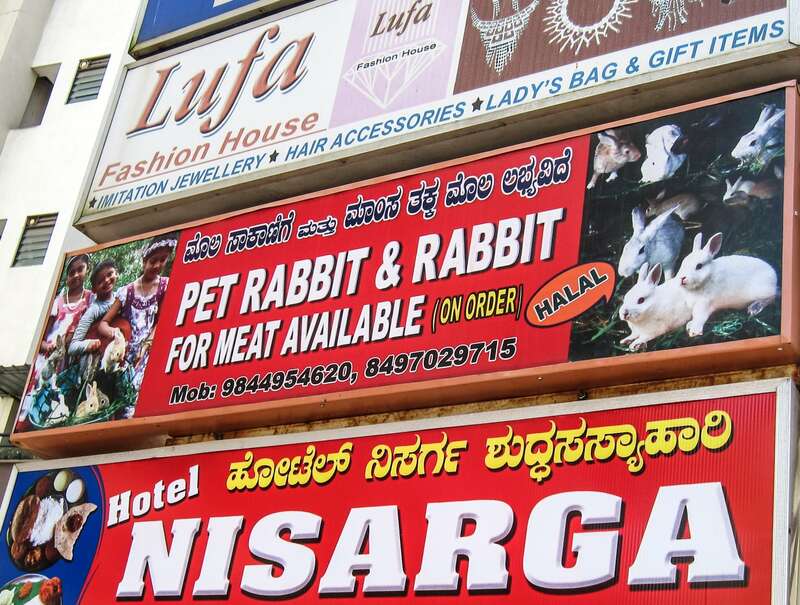 Don’t worry, honey, your new pet is Halal (just in case…). 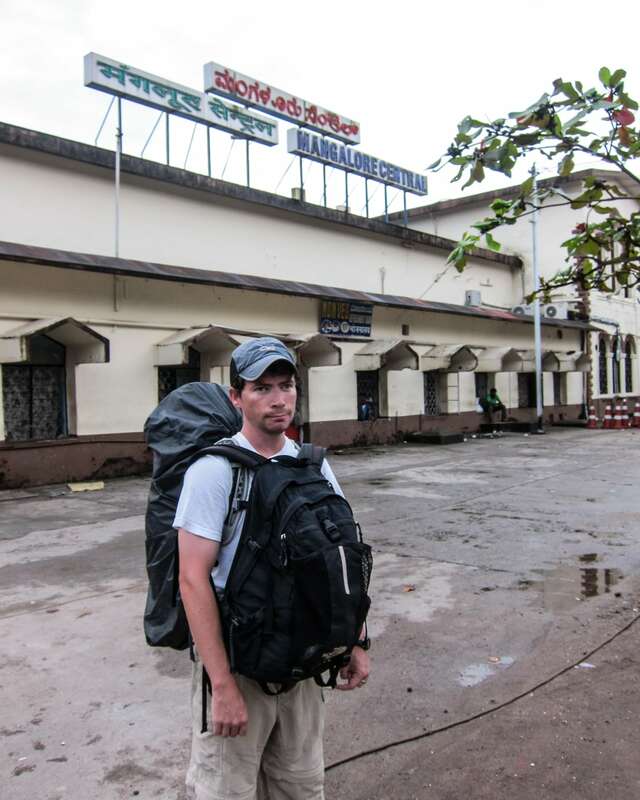 That’s a look of sadness on my face for leaving Mangalore after such a short visit (or, shortly after learning that our train had been delayed for several hours?) But seriously, Mangalore ended up being a worthwhile stop. If anything, it gave us an insight into contemporary Indian life that most travel destinations in India don’t, exactly. We browsed malls, hung out at a coffee shop (Cafe Coffee Day, of course…), groped the produce at a local supermarket, poked our heads into this and that shop, and marveled at how few people actually do speak English away from the tourist centers. 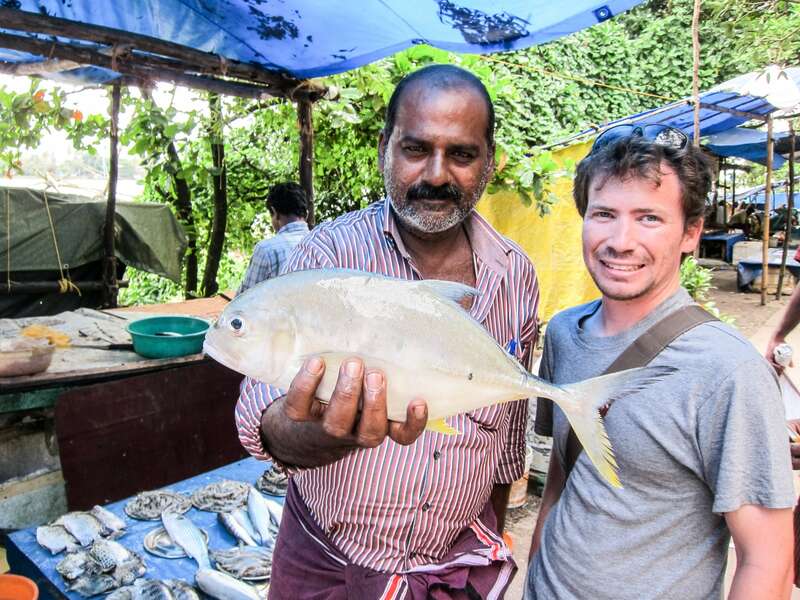 And then…we arrived in Fort Kochi! 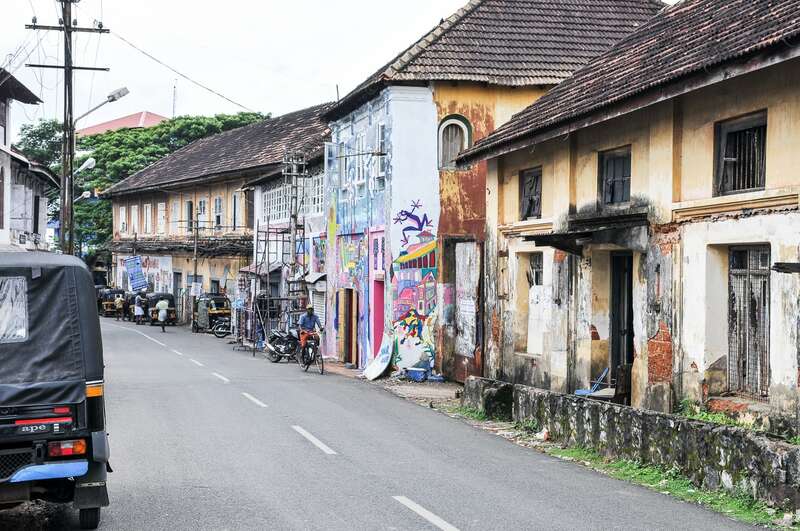 Only about 250 miles south of Mangalore, but a world apart, Fort Kochi was everything we hoped it would be — culturally endowed and colonial, yet shabby, local and thoroughly Indian. 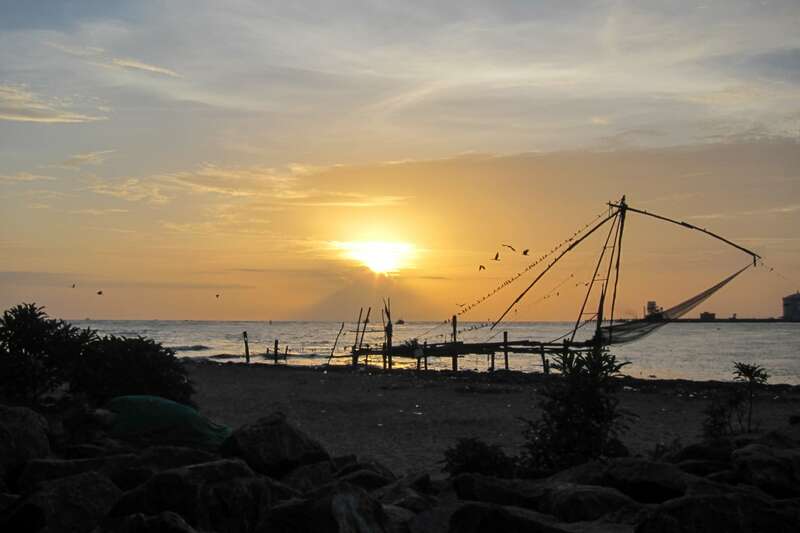 While the names Kochi and Cochin are often used interchangeably, Most Indians seem to refer to the greater metro area (including Ernakulum on the mainland) as Cochin and the historical area (the northern tip of Vypeen Island) as Fort Kochi. 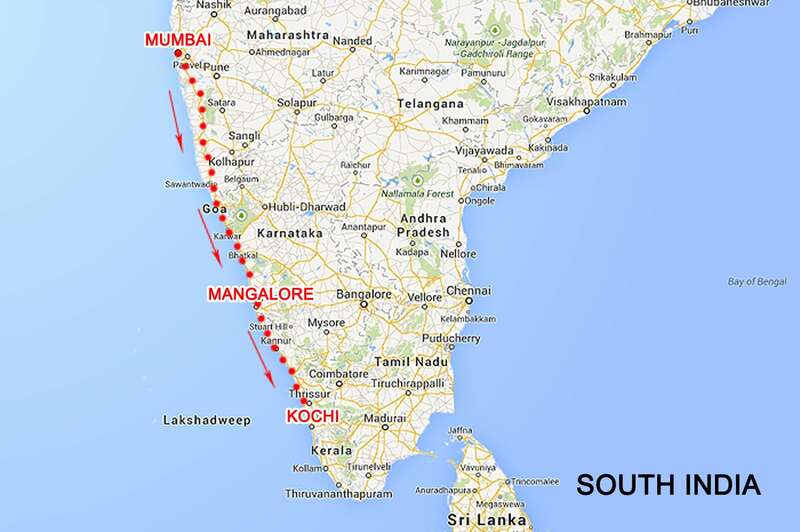 Yet, technically, Kochi (or Cochin) refers to the 18 northern-most square miles encompassing a small group of islands. Confused yet? Welcome to India! Fort Kochi, in particular, is known for a lot of things, chief among them the huge Chinese fishing nets that line the shore (above). Still fully functional and fully in use, fishermen employ these cantilever monstrosities to roundup the daily catch. It appears to work surprisingly well, especially being that you never actually have to leave the shore! 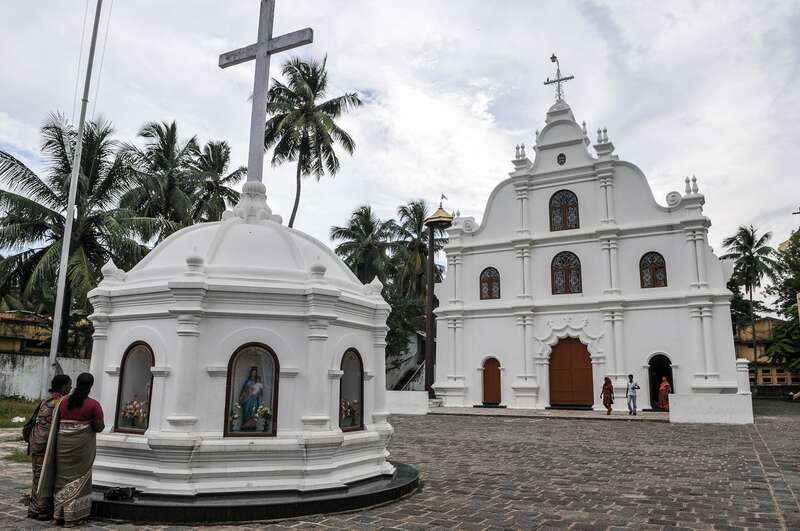 Fort Kochi is also home to one of the largest concentrations of Christian churches in the entire country, owing to its Portuguese heritage. This was the heart and center of power of old Portuguese India. 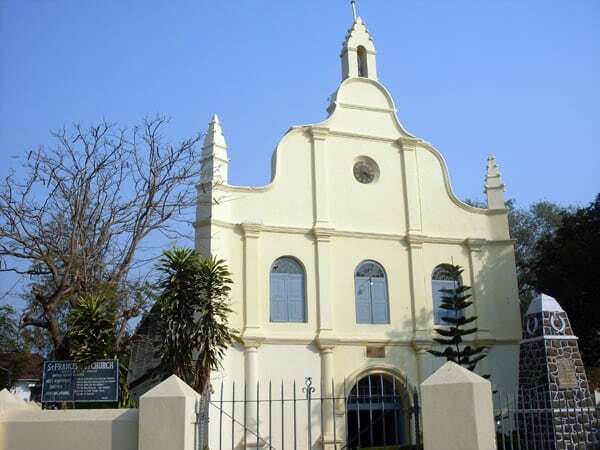 Below is St. Francis church, the oldest European church in all of India, dating back to 1503. St. Francis Church, Fort Kochi, India (By: Vineeth Venugopalan, 2009, Wikipedia). …at least that’s what it looked like in 2009, according to Wikipedia. St. Francis had apparently aged considerably by the time we got to it in 2012…and YES, this is the same church, just three short years later. Another big, fat welcome to India! St. Francis church, photo taken by me in September 2012. A common story that you’ll hear a lot in these parts is that Vasco Da Gama is buried here. Not true! He wasburied here, but his bodied was dug up and moved to Lisboa 14 years later. Judging by this photo, I’d be surprised if there was anything left to move! 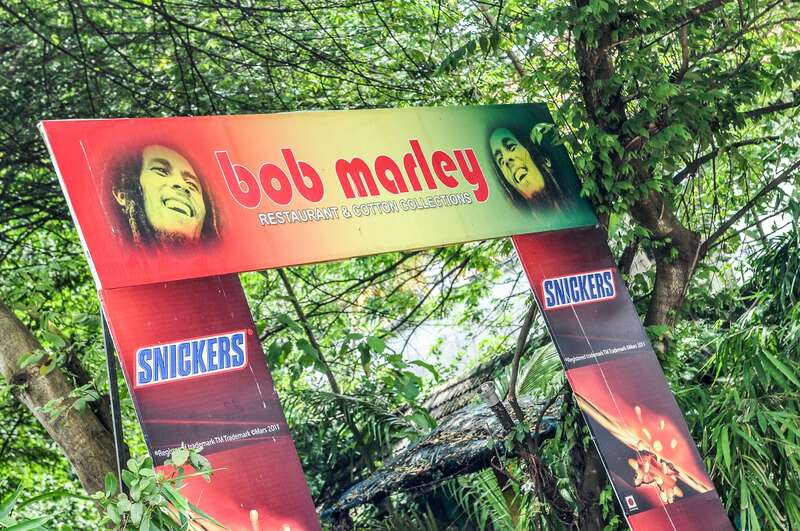 You know, I always thought Bob Marley should’ve endorsed Snickers peanut caramel chocolate goodness (for one very obvious reason…), but never thought my dream would become reality…until I came to India. 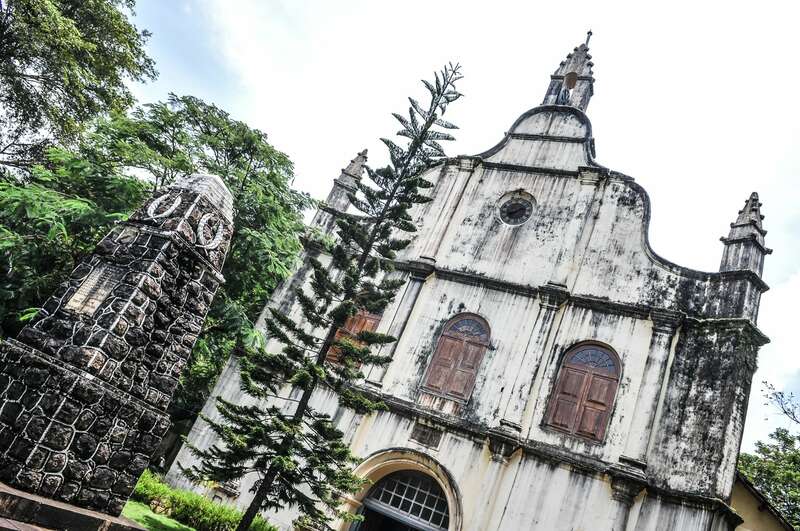 Back to churches of Ft. Kochi, here’s one in a slightly better state of repair, Our Lady of Hope church…indeed, there may be hope for these old landmarks yet. Something that doesn’t necessarily shine through in this post is how incredibly strange and out of place these churches seemed to us in India, a country where only about 2% of the population subscribes to Christian beliefs. Granted, in India that translates to roughly 25 million Christians, but you just don’t see structures like this very often. After nearly three months of Buddhist and Confucianist temples in China, and Hindu temples and Muslim mosques in India, we found ourselves unprepared for how surreal this encounter in Fort Kochi would be — somehow both familiar and disorienting at the same time. Here, we’re in Jew Town (that’s its actual name), taking in an art gallery/ gift shop/ cafe, drinking some ginger juice stuff and chewing on cinnamon sticks. Now, how many places in the world can you do all of that at once? I can’t think of any. Maybe only in Jew Town, India. 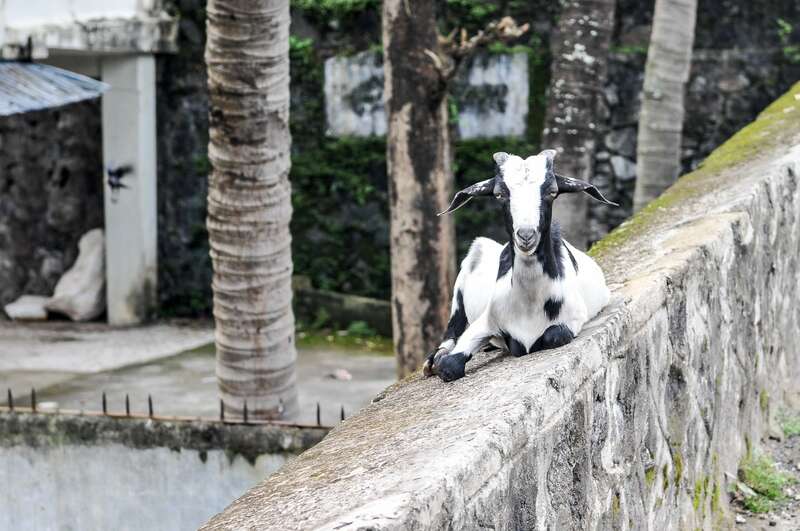 Jew Town is known for both its artsy vibe and pensive goats. 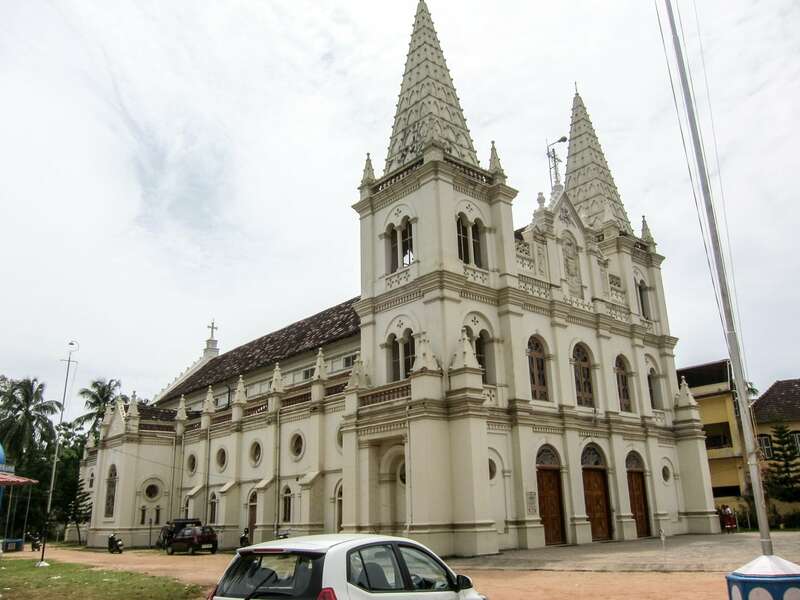 Back in Fort Kochi, here’s another church — Santa Cruz Basilica. I especially liked the Hindu temple-inspired spires. Now we’re getting into the realm of the truly surreal. 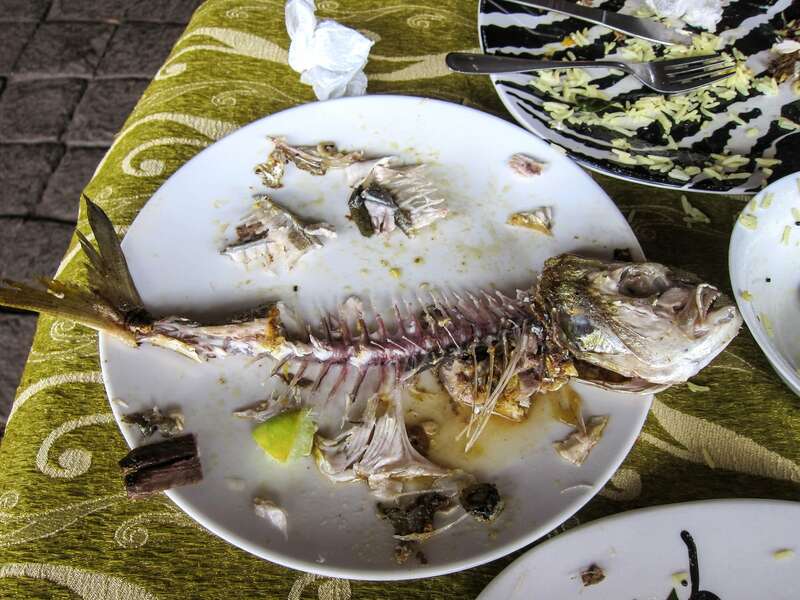 After purchasing the fish from the waterfront, you take it to one of a handful of small restaurants who grill it up for a nominal fee, with a couple of sides. All told, our delicious lunch cost US$8 including the price of the fish, grilling, sides and two sodas. While we’re on the topic of Indian food…I haven’t professed my love for Thalis in a while. Have I told you lately…that I love you…Thali? Thalis make the madness of existing in India almost worthwhile. Cheap, fast and DELICIOUS. A Thali is basically a variety of small plates served on a tray with flatbread (naan, roti, chipati), generally around lunch time, but you can get a Thali for dinner too. This one is preparing to be devoured at a restaurant called Dal Roti in Ft. Kochi — a no frills joint with a friendly and gregarious host. 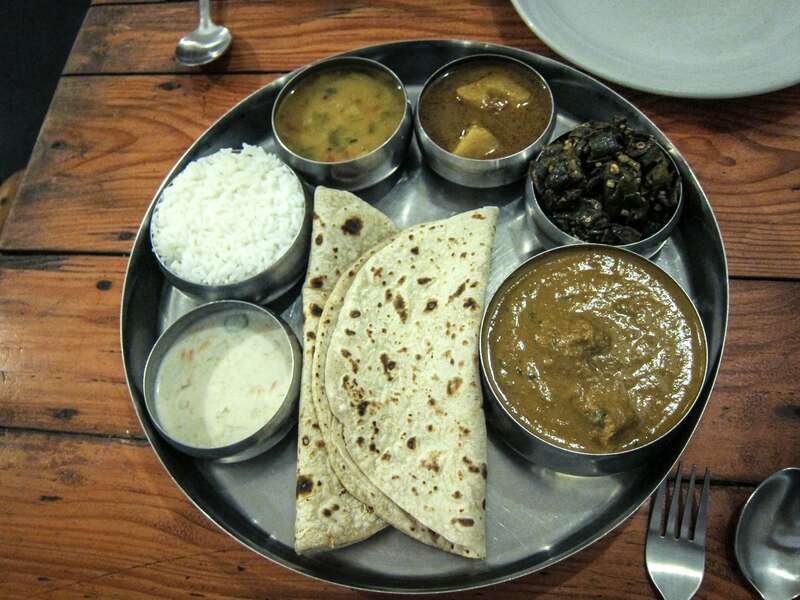 As is common in India, Dal Roti is a veg-only restaurant, so this is a veg-only Thali. 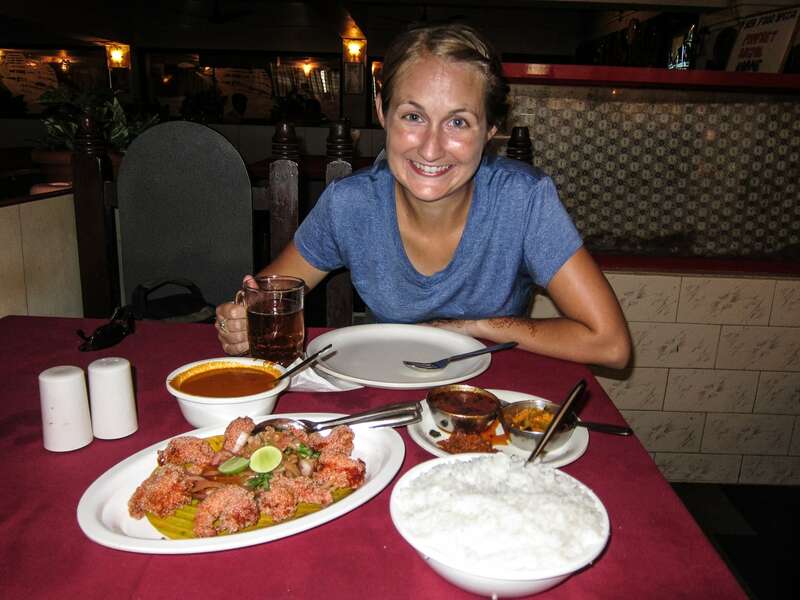 You can also get meat Thalis throughout India (we had quite a few in Rajasthan!). Now, excuse me while I inhale Lori’s portion while she’s momentarily distracted by candy.